Plus500 is a broker of whom you must have heard. You may praise it or curse it as many traders do. Let’s throw prejudices away and look at Plus500 without bias. Having tested the basic features for you, you can compare to what extent our experience regarding its trading platform and the opening of an account meets your expectations. Plus500 is a CFD broker, established in 2008. It is an Israel-based broker with affiliations in London and Limassol. Its key advantage is an in-house platform, which requires a standard internet browser. Plus500 has been offering support in various languages and trading in all different currencies for literally years. I assume that you want to start your trading with a demo account. Which is exactly what we recommend. Nothing is easier than to open an account with Plus500. Within a minute everything is done. You just enter your e-mail, password and get access to the trading platform with a virtual million on your account. All this is happening in your browser, so you don’t have to make any installations. The availability of choosing any platform is a big plus to start with. Especially users of OS X, (i.e. Apple product) will be happy because a lot of trading platforms offer Windows only. Plus500 has also an application for Windows. As to the operating systems and the usage, you can rely on platforms for both iOS and Android allowing you to watch your trading from any place, indeed. The disadvantage of doing business over an in-house platform is that you can’t accommodate the chart to be better readable. This is a minor flaw. But you can still open MT4 aside; just in case. If you decide to enter a trade you will log in (in the browser) and execute the trade. 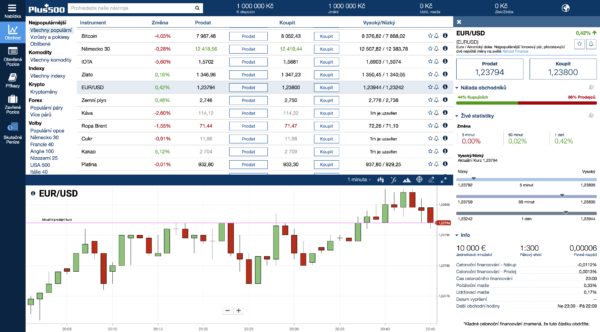 The trading platform as such is very simple and mostly intuitive. This is what some experienced brokers may see as a disadvantage. After opening the system, in the top section of your screen, you will see a list of instruments, in the lower section the chart. You can easily choose your preferred instrument by the name or go through the list. Given the countless number of currencies, cryptocurrencies, commodities, shares, indices, I recommend that you enlarge the chart to cover all your screen and read it in detail. A quick trading order to sell or buy can be chosen from the preview. Look at the picture above. Your chosen instrument is complemented by sentiment. Be careful, brokers offers this data from time to time but usually this data is data from a given broker i.e. client data. Even the biggest retail trading broker is not big enough to keep its data absolutely accurate. There is a way to make the data more precise, which is to add some data from futures. Anyway, I don’t think that Plus500 is using this method. Be cautious with this indicator. As to the list, details about currency rates in various time zones are more interesting – unit volumes, leverage or a tight spread. Useful is also the below information including trading hours. This list is highly appreciated. So far, so good. All looks nice and transparent. What about the number of instruments offered by Plus500 for analyzing the market? Here I must admit this is one of the limitations of having a trading platform in a browser. If you work with MetaTrader in more detail perhaps you download or create your own indicators and insert them in MetaTrader folder (typically on disc C://Program Files/Meta Trader/Indicators). With a browser you don’t do such things, do you? Well, but is it necessary? Making a basic analysis of trend lines is an easy task, no problem. You can also add Fibonacci lines, an arc, a fan or just some text. The portfolio is broader one may get the impression that nothing is missing. Or am I wrong? With Fibonacci setting, I appreciate the possibility of adding your own level. This is a fundament. The portfolio offers default basic values but some forex traders use their own values. I personally tested some more levels and from time to time displayed them on the screen, just in case. With Plus500 this is not possible which is a pity. In the top section next to the timeframe, you can see a traditional coordinates cursor. Those who prefer indicators such as ADX or Stochastic will surely appreciate it, I think the selection is more than sufficient. Fortunately, the broker did not forget about the setting of indicators so you can choose a period you like. This is an area without limitations. You will not be surprised by the simplicity of all transactions, taking a long or short position, trading commodities or application of indicators. Here I must warn you. It’s the default amount. This may not comply with your money management and you will feel that it is too high. Always check the amount of your trade first before placing the order. A natural question: How to trade? We described the process several times in the past. There are hundreds or even thousands of forex trading strategies. Of the quantity available on the internet we have shown you some ways for example gap trading. In gap trading you speculate on filling gaps occurred usually over weekends when trading is closed. Another option to apply this strategy is to find three candlesticks where the high of the first one does not overlap the low of the third one (in case of an upward formation) or the low of the first one does not overlap the high of the last one. Using these levels, you will draw trend lines and after a breakthrough takes place you will speculate on filling the gap. It may look as follows: (middle candlestick is the 6th from the right, the chart includes highs of the previous one and lows of the next one, they don’t overlap but logically form a gap). This trading strategy matches with the Plus500 concept as it is simple, transparent and – in the opinion of many traders (me inclusive) – functional. Obviously, it depends on the settings, instrument etc. If you are interested in this trading strategy test it on a demo account using historical data. We don’t recommend that based on this article you start trading with a live account. Ideas are nice but the practical making of a trading strategy is your homework. TIP: Further strategies are available at our websites, there is a plenty of such. Plus500 manages more challenging analyses. Overall, the number of limitations is minimal. I dare say that 75 % of traders are happy with the existing amount of features. Otherwise, they would not continue trading with this broker.